Despite its sturdy construction and a classic style appropriate for almost any living room, the free couch remains on the sidewalk. 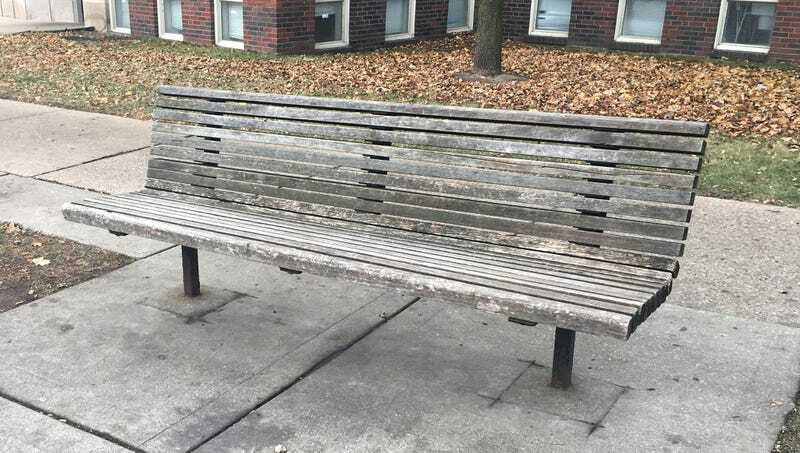 MINNEAPOLIS—Struggling to fathom why no one has yet claimed the perfectly good piece of furniture, local man Adam Ellery told reporters Wednesday that a free couch has been sitting on the curb near his apartment for months. The couch, a 6-foot-long settee made of solid redwood drilled into cast-iron supports, has reportedly remained out on the pavement since Ellery moved to the neighborhood nearly a year ago. Describing the couch as a vintage piece that features fashionably distressed lumber and aged, rusty screws, Ellery remarked that he grows increasingly bewildered each time he walks by and sees it is still there. According to the 30-year-old digital media manager, passersby frequently stop to try out the couch, often sitting on it for a while as they read a newspaper or eat their lunch. But in each case, he said, the person stands up within a half hour or so and continues on his or her way, mysteriously passing up the chance to take home some high-quality seating at absolutely no cost. “Honestly, I’m beginning to question why someone would even throw away a couch so nice in the first place,” he added. Ellery went on to state that given how long the couch has been out there on the sidewalk, he is surprised no one from city services has been sent to pick it up and dispose of it, especially considering how tidy and well-maintained the rest of his neighborhood is. While remarking that he is glad the couch hasn’t yet gone to waste, he expressed concern that if someone doesn’t “scoop it up quick,” it could get rained upon and ruined. “God, it’s crazy how wasteful people can be,” he continued. Ellery added that he would gladly take the couch home himself, but he already has two exactly like it.